We were “picked up” from our hostel at 4:30am by one of the guides and followed him on foot down to our bus at nearby San Francisco Plaza. 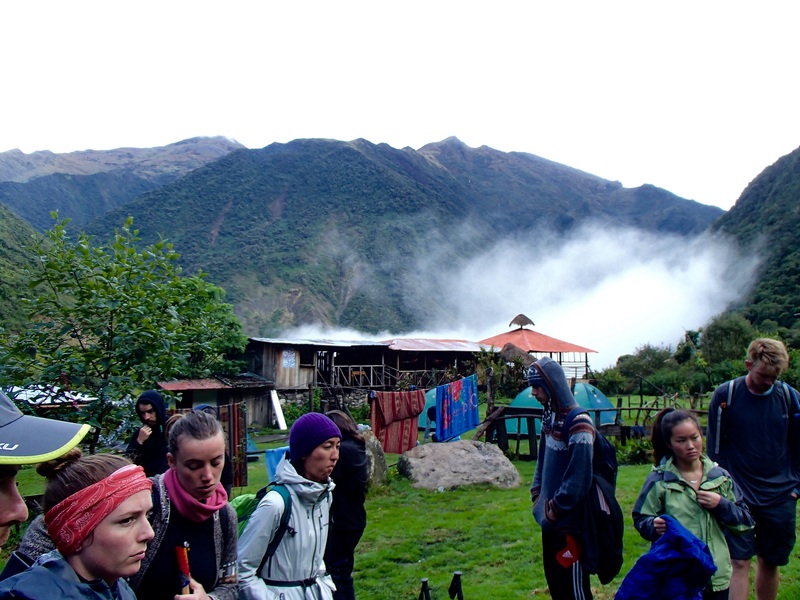 Here we met up with the other 30 people who would also be trekking Salkantay with us over the next week. It was two groups, and though we were a little surprised that they had managed to fill our tour on the first day of the season (16/tour is the max), it wasn’t entirely unexpected. We heard that all of the agencies will combine the people they sign up until they’re able to fill a group. 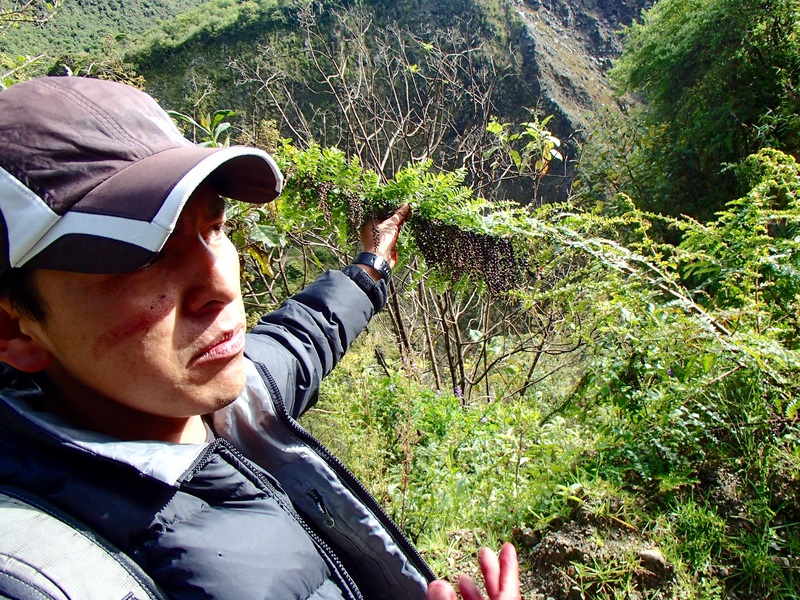 From Cusco, we bussed a few hours to the starting point of the trail, in Mollepata. We had a quick breakfast, and began our trek with high spirits and sunny weather. Within the first kilometer our suspicion that it was not going to be an easy trek was confirmed. In spite of fairly light daypacks the high-altitude air was thin and the inclines steep. The views of the surrounding mountains made it worth it though, and we caught our first glimpse of snow-covered Salkantay Mountain. By the time we stopped for lunch around 1pm we were all more than ready to eat and happy that the trek included cooks who took care of all of the food prep. Once we all arrived at the lunch spot we were served a tortilla chip with a spoonful of guacamole, and a bowl of soup. And then…nothing. We started looking around seriously concerned with the food situation. Our tour agency had recommended we bring lots of snacks, but we thought that was more for the actual trekking time — not to stand in as the other half of our meal. Just as the group was getting up the nerve to ask if this was it, plates of rice, beans, and meat appeared. Whew! After lunch we had another few hours of trekking before arriving at our camp for the night. It started to rain shortly after lunch and we were happy for our last-minute purchase of rain ponchos to go over our rain jackets and keep our packs dry. A few more hills, river crossings, and some very wet shoes later we were happy to have a hot dinner and settle into our tents for the night. We camped at the bottom of that beauty the first night. Day 2 started early again with a 5:30am wakeup, made somewhat better by the tent-side delivery of coca tea. 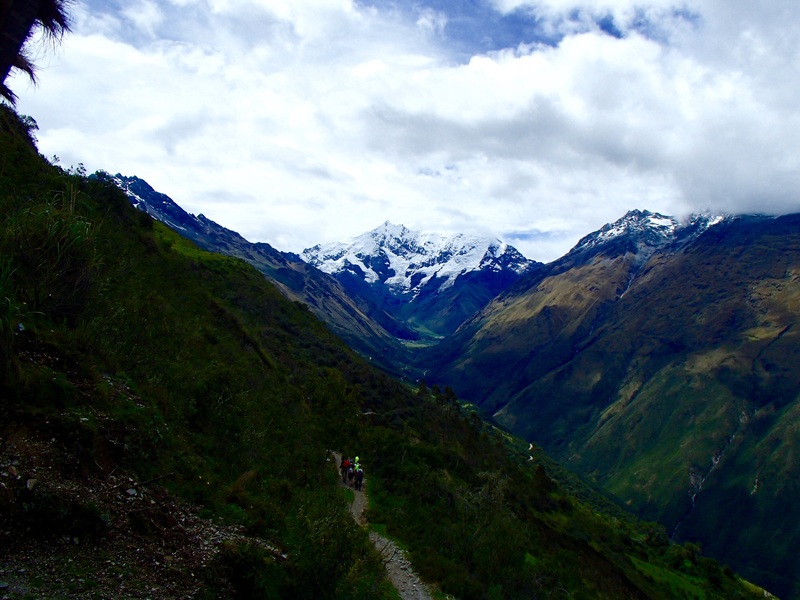 This was to be our longest day, and highest altitude as we climbed to Salkantay pass. A couple people in our group rented horses to ride to the top, but our stubbornness (and budget) meant we were doing it on our own two feet. True to our expectations the climb was gruelling — our legs were already tired from the day before and it was pretty much straight up the whole way. We made it, and yes it was worth it! But…we made it! Shortly before we arrived at the pass it started raining, and by the time we got there the wind and rain were both driving hard. We snapped a couple quick photos with our group and the iconic Salkantay sign and quickly started our descent down the other side. This is where I learned: down can be WAY harder than up. Especially 17k of down all at once. The rain continued the whole way and we struggled to keep our footing while avoiding the cow pies along the trail. The views didn’t improve much until late in the day when the clouds finally cleared a bit and we were able to see the towering waterfall-covered mountains to the right of us. This was our trail down the mountain, I’m not playing in a river! Needless to say by the time we got to the end of Day 2 we were completely exhausted. Kyle twisted his knee on the way down and by the time we made it into camp he was in pretty bad shape. I hit my physical and mental limit around mid-day when the altitude finally got to me. 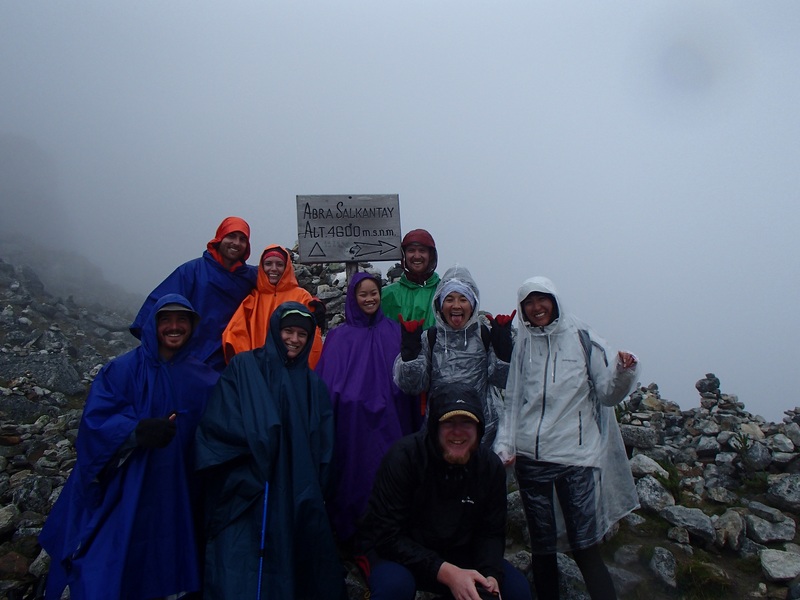 But, tired, sore, and wet, we had successfully trekked over the pass. Bonus: the tiny store near our tents that night sold both giant beers and pizza-flavored Pringles. It’s the little things. Even with Coca tea I am still not a morning person. Day 3 things started to turn around. We woke up to sunshine and a shorter, flatter trek ahead. Shortly after heading out Ed, our guide, stopped to point out red berries growing next to the trail that locals used to dye clothing. He then proceeded to give us all Puma war paint (Puma being the name he gave our group, war paint being red berry streaks on our faces). After lunch we hopped on a bus that took us the rest of the way to our final campsite, a welcome break from the previous 10-12-hour hiking days. From there out it was all play and no work. We hopped a second bus over to the nearby hot springs, during which we collectively finished off a bottle of rum and spent the next few hours relaxing our sore muscles in the natural springs. After the hot springs it was back to our campsite for dinner and an epic bonfire/dance party. Most unexpected part of the trek: dancing to the YMCA with a new group of friends in the middle of the Andean jungle. No tent this night, but an amazing river! 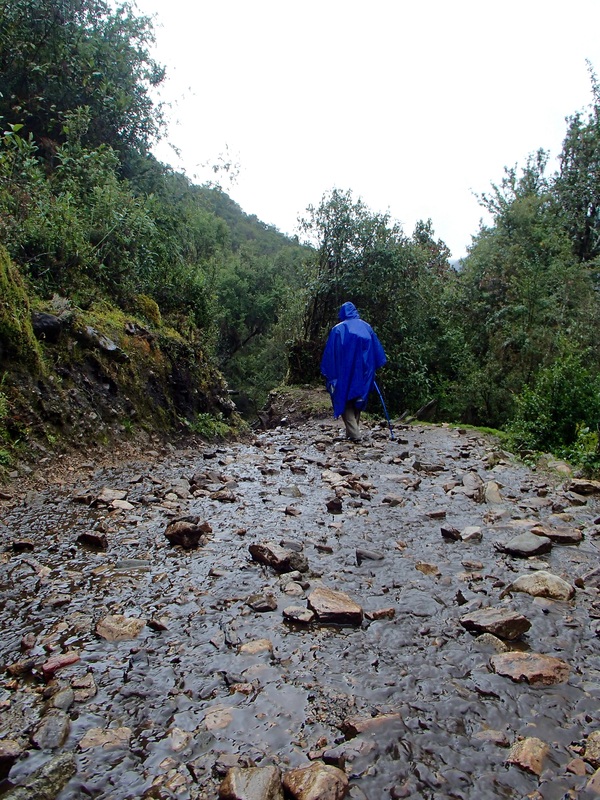 On our final day of trekking we woke up to mild hangovers and more rain. After a very brief debate we opted to take the 10-peso shuttle bus the first few kilometers. It drove us as far as the first river crossing where the rains had washed away the vehicle bridge and left only a very rickety footbridge. From here we got out and finished out the hike through Hidroelectrica to Aguas Caliente. Our tour had arranged a basic hostel in town, and we had one last team Puma dinner at a local restaurant, celebrating having all made it through the last 4 days and exchanging contact info. We woke up at 3:30am to make sure we would catch the first bus up to the entrance. Our efforts were rewarded — we were first in line, aside from a few stray dogs. The rain held off and we had a great view of the ancient city laid out ahead of us. Ed gave us a brief tour of the grounds when we arrived, bringing us around to a number of the sites and explaining the history of the Incas. 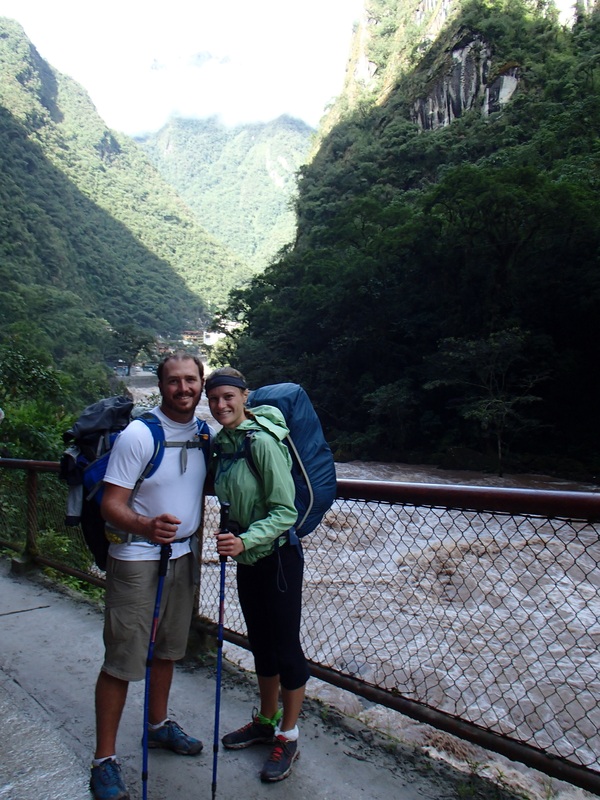 After that, we were on our own to wander the ruins and climb Huaynapicchu. It was really cool, and a bit surreal, being able to wander freely among the ruins and experience the massive city that was built in such a remote location over such a short time period. It’s only partially uncovered and never finished, but it’s still breathtakingly! 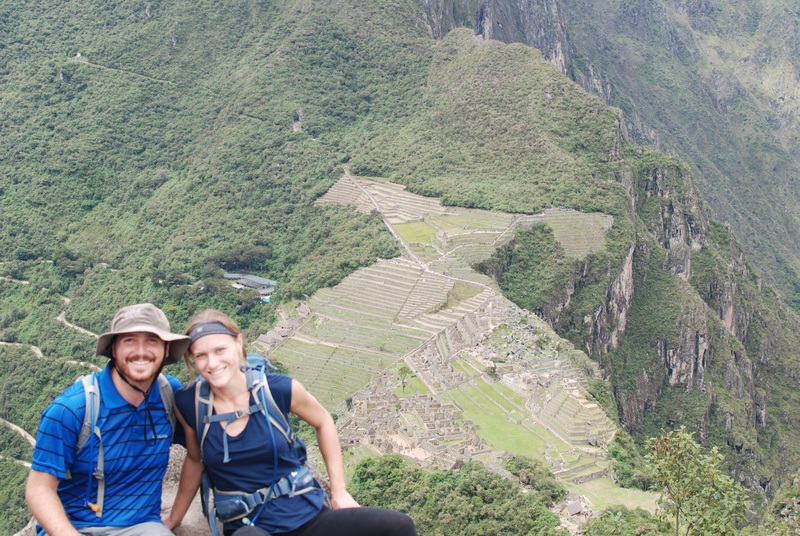 Speaking of Huaynapicchu…if you have the chance, do it! 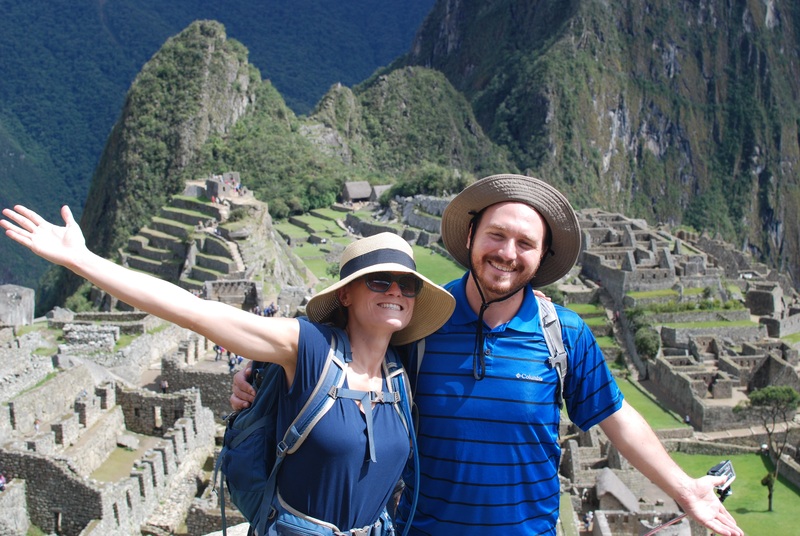 The climb to the top is straight up steep vertigo-inducing stone steps, but the view of Manchu Picchu and the surrounding valleys are spectacular. I’ll let the pictures speak for themselves. Bring newspaper! It does an amazing job at drying out shoes overnight. While many hikers started day 2 with soggy shoes ours were only a little damp. Also useful: small plastic bags. If you can’t dry your shoes you can tie these around your feet so your socks don’t soak through. A huge help toward the middle of our trek when we were walking in muddy roads-turned-rivers. Booking in-person is a huge money-saver. I’d recommend anyone doing this talk to at least a few different agencies before making a decision though. It’ll give you a good baseline for what’s standard. It turned out there were other people on our tour who were completely mislead by the agency they booked with. Some of the discrepancies were group size, max number of kilos per non-day-pack, and one agency even introduced them to the wrong guides. I’m really glad our agency was upfront about all of these things. Pack light. By the end everyone is smelly and a few well-packed layers are much better than a new outfit for every day. Plus, you’ll be much happier with yourself come day 4 when the mules/trucks/porters go away and you need to carry everything (including your sleeping bag) yourself. In summary: we left completely exhausted, and equally accomplished. It was the hardest thing we’ve done, mentally and physically, but well worth every wet, muddy step. Machu Picchu is on our bucket list. It’s fantastic! I highly recommend it and we’re happy to answer any questions you have — happy travels!